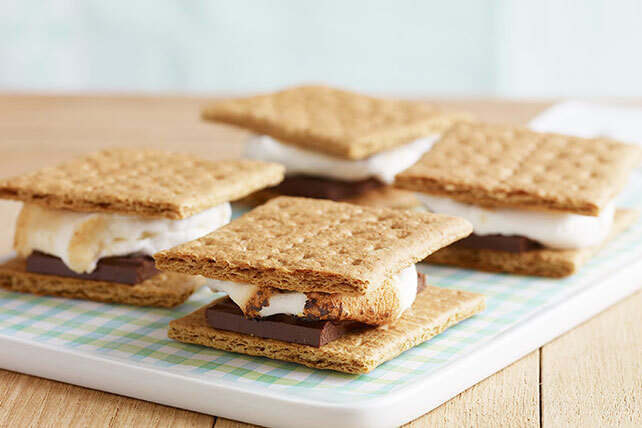 Enjoy this easy Classic 'Smores recipe around a campfire or in your kitchen. Classic S'mores are a combo of graham crackers, marshmallows & chocolate. Fill graham squares with marshmallows and chocolate to make 4 s'mores. To make indoor s'mores, do not toast the marshmallows. Place 4 graham squares on microwaveable plate; top with chocolate and marshmallows. Microwave on HIGH 15 to 20 sec. or until marshmallows puff. Cover with remaining graham squares; press together gently to secure.